Inante is the company behind BRÜ: the first complete mobile commerce solution for local, indie coffee shops nationwide. 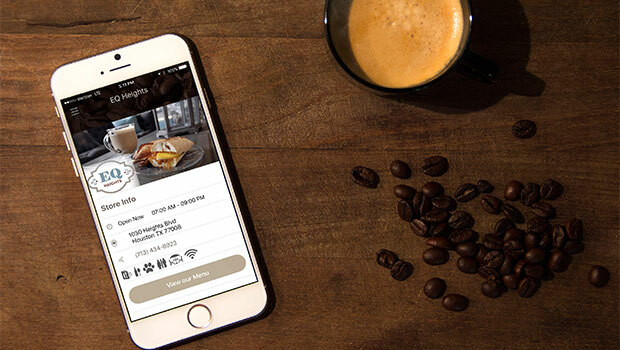 As the world moves to mobile commerce, giant coffee brands are at a decided advantage. Moving to mobile payments systems complete with loyalty programs and clear benefits is costly to develop and maintain. It’s tough for local coffee shops to keep up, so coffee lovers often choose the convenience and perks of Starbucks over indie shops. 87% of shoppers have indicated that they want loyalty programs according to taltech’s Retail Technology Report, 2015, People are opting for brands that will reward them as opposed to the local shops. BRÜ gives the power back to local coffee shops, creating a network of independent brewers who can deliver the same world-class mobile experience as a behemoth like Starbucks. There has been a burst of growth with smaller, independent shops, but most of that growth has still gone towards big chains as Starbucks is raking in nearly 21 billion in revenue for 2015. Why? It’s not because the coffee is better. It’s often a simple matter of convenience. With ubiquity and a robust mobile app that features mobile commerce, solid rewards programs and clear benefits, big chains are seeing the vast majority of the benefits of growth in the industry. And it’s only getting worse for local coffee shops across the country. So how are local shops supposed to keep up? By offering the same convenience and perks as the big guys. But a robust mobile solution is prohibitively expensive. Who can afford an entire team of mobile devs? 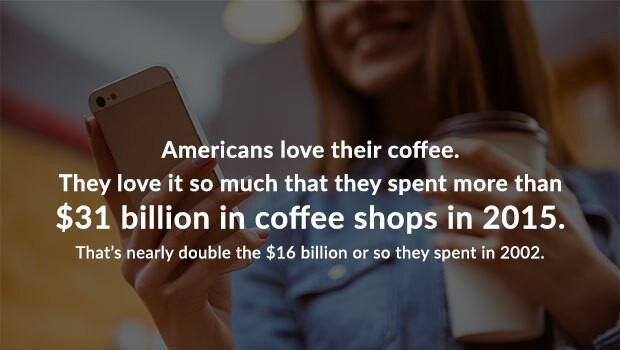 Let’s bring mobile commerce to local coffee shops across the nation. Starbucks and Dunkin Donuts have risen to prominence largely on the backs of their loyalty programs. Customers want to feel valued and want to receive value in return for their loyalty. Now, local shops can offer just that. Starbucks also benefits from a “high rent, high return” strategy: placement in very prominent locations makes the chain more convenient, but they also benefit from high visibility. By allowing local shops to communicate with their customers regularly, indie brewers can foster the same familiarity and loyalty. Starbucks collects a ton of data on its customers, adapting their business to adapt to consumer trends. With BRÜ, local shops will have the ability to collect meaningful data on their customers to gain significant insight into how their customers’ behavior changes over time. Imagine walking into your favorite coffee shop and taking a seat on one of their plush sofas, then placing an order for your favorite brew without even leaving your seat, from your phone. If your coffee shop is a BRÜ customer, their barista will receive the order—paid in full through the mobile app—and when they call your name, simply walk up to the counter to get your perfectly brewed cup of joe. BRÜ venues can even host events with our built-in event scheduling and messaging systems. Got a live band coming in? A guest speaker? A sale on coffee gear? Let your customers know, instantly. Let’s see Starbucks compete with that. That’s the BRÜ vision, and it’s coming to a coffee shop near you. It’s secure. BRÜ takes security seriously- we use the most secure transmission and encryption methods on the planet. It’s informative. Real data means real insights into your customers habits and desires. BRÜ provides industry-specific data, pure and undiluted. It scales. BRÜ is nimble and ready to grow when you are. It’s powerful and it’s fast. BRÜ’s cloud based backend is constantly monitoring for optimizations based on current usage, and can process requests in less than 30 milliseconds. It can stand on its own. The BRÜ Hub is a standalone device with full capabilities to make integrating the BRÜ platform into a new location even easier. BRÜ is now completely built, including the analytics functionality, and a beta version has been approved by Apple for a September launch. Our Hub is also completely built and in the prototype stage. The iOS and Android versions will be feature complete and ready for testing in October. In the meantime, we’re adding new store locations, including menu items and amenities, to gain traction before an official launch. Ready to hear what’s in store for Inante and BRÜ? Click the “business plan” tab at the top of this page to find out how we’ll capitalize on the intersection of multiple consumer trends to create a new network of local coffee shops across America! Daniel's extensive experience in customer service and management began with Wal-Mart as a Customer Service Manager under the influence of Sam Walton’s protégé and then at VoiceStream Wireless, now T-Mobile, as Executive Director of Operations, establishing three call centers and setting award-winning standards for outstanding customer service. Currently, Daniel is the Director of Customer Support for MediaFire. He is deeply engaged in various charities and has served as a board member for multiple organizations. His musical interests include the violin, trumpet and piano. Aaron has worked as both a developer and a systems administrator, creating and maintaining critical systems for Cy-Fair Volunteer Fire Department, who provides 911 fire and EMS, and for MediaFire, a cloud storage company with millions of users worldwide. Self taught and driven by his love of technology, Aaron is constantly tinkering with new technologies in his free time. His hobbies include cooking and virtual reality gaming, particularly online racing, for which he has constructed a VR racing simulator. James received his B.S. in Chemical Engineering/Material Science in 1995 and worked at Dow Chemical for over 20 years. While there, he specialized in production and risk management. He likes diving into the numbers and doesn’t mind being buried in the details. With a Six Sigma and Black Belt certification, he's Inante’s ROI guy. James is community-oriented and is often found supporting causes fighting for an HIV and MS cure. He’s also a champion for workplace equality.